The Hare And The Tortoise– Lop the Hare, the fastest animal in the forest, is distraught when she discovers that not a single animal signs up to compete in the Annual Animal Racing Contest, for fear of losing against the reigning champion. Hadrian the Tortoise decides to save the competition by volunteering to race against her. Baffled by the old shell’s foolish decision, but too proud to turn down the offer, Lop agrees to race Hadrian in what she believes will be her easiest race yet. Can slow and steady beat the fastest animal in the forest? Come one and all to the woodland place, Tortoise and Hare are having a race! 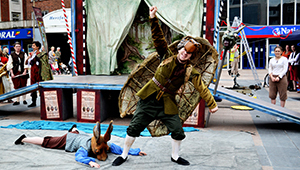 The Hare and The Tortoise vignette was created in 2013 as a roaming walkabout animation and as a main staged show for ‘The Carnival of Animals’ production that was part of the Coventry Mysteries festival, supported by Coventry University, that The Fabularium performed in.